Letters to Elijah: Back to School = Germs + Other Nasty Stuff! If this is your first year having a child in school it could mean some sick days. Schools can be big germ incubators! Making sure your kids are getting enough sleep, eating nutritious meals, and washing their hands often can be a great doses of preventative medicine. Sometimes no matter what you do your kids just bring home nasty stuff. Two years ago Sara brought home a note saying someone in her class had head lice. Gross! The note suggested for us to check our kids. The moment I checked her hair there they were... gross!! (Man, my head is just itchy writing this post! is yours now too?) I ran to the closest drug store and pretty much bought all the head lice removal stuff I could get my hands on. Whew - that's a lot of work. There are shampoos, special combs, creams and sprays. It's all pretty expensive too. However, you don't really care when your child has bugs crawling on their head.... unless.... they don't work. The next morning - they were back! Double Gross! I called the school and here is what the nurse suggested: Full Fat Mayonnaise! Yes, Full Fat Mayonnaise! One cup of mayo and wrap the head for 1 hour (I did it for 2 hours - I wanted those bad bugs gone!) Guess what? it worked!! Gone, never to be seen again! So if you ever have the nasty experience of head lice don't run out and spend all your money - just go to your kitchen cupboard instead. plus all that stuff is full of nasty chemicals etc. that I would not anywhere near my kids head. Her face looks all healed. I learned by putting a little hairspray on the kids heads also prevents lice , because they have nothing to cling to. anonymous: interesting tip, I've never heard of that. denise: it makes you wonder what all those chemicals are! Hi! I ran into your blog through my friend's blog. (Unconventional Origins) While I'm not a mama yet, I figure I can learn a lot through the wit and wisdom of other mamas. Dana - its me Teresa , I don't know why my name didn't take - my hairdresser told me about the hairspray and so far so good , none to be found in my house when they have been in the classroom . Ewwwww...knock knock on wood, I haven't had to deal with that yet. Thanks for the tip, though! Those germs are unbelievable, my boys already have colds! Wow! 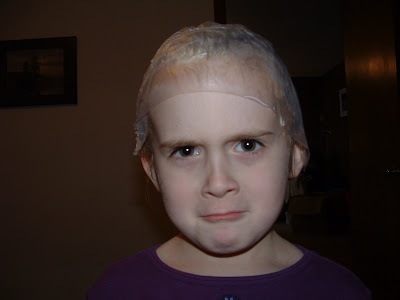 I just posted about lice on Savvy Source. And my head IS itching now. That is amazing and disgusting all at the same time - thanks for the tip! I did the mayo trick when my boys had it and gave it to me - works like a CHARM!